This is the heart of the freemium model where you get many things free, which is possible because of the aggregation construct, where companies provide those digital products and then create an ecosystem to sell adverts. The firms benefit more than the suppliers by providing the platforms [Facebook makes money for photos supplied by families. Sure you like the Likes]. 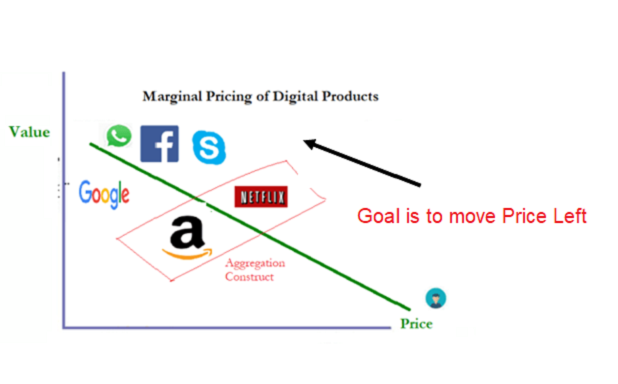 As shown in the Figure, great companies deliver the near-zero marginal price for high quality product, making it challenging for anyone that carries a non-zero marginal price to compete, exacerbated if the product is even not top-grade. This is one of the biggest challenges digital entrepreneurs face.